When Lucy and Ethel learn that their husbands have been chosen to judge a Miami Beach bathing beauty contest, they devise a scheme to keep them from officiating. Lucy instructs the dock attendant to fill the gas tank on their boat only halfway so that their pre-contest cruise will abort in the middle of the ocean. Then, when it's too late for the husbands to attend the contest, Lucy will "discover" a thermos of gasoline, just enough to get them back to shore. While the gals are stocking up on suntan oil, Fred discovers the dangerous, gas-filled thermos and leaves it on the dock. Sure enough, when the time comes to turn back for the beauty contest, the motor sputters and stops. The boat eventually drifts ashore on a seemingly deserted island. Lucy and Ethel go off to explore one part of the terrain, and the husbands and Little Ricky take off in the opposite direction. The men encounter actor Claude Akins, who's dressed as a fierce, war-painted Indian, and two bathing beauties, who are filming a documentary about Florida. To teach Lucy a lesson after the gasoline incident, Ricky enlists Akins in a plot to scare the bejesus out of the girls. While Lucy and Ethel are lamenting their state, along comes ferocious Akins, pretending to be an uncivilized native warrior. When the wives have been sufficiently frightened, Ricky and Fred appear and explain the truth about Akins and the island. 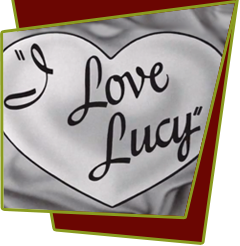 Lucy is deflated further when she later learns that the beauty contest has been postponed until the next day. Special Notes: Lucille Ball and Desi Arnaz threw a luau party on the island set after the episode was filmed.